Once you have iCloud set up, it becomes easier than ever to keep recent backups of your iPhone and iPad. With iCloud backup enabled, remember that the backup starts automatically any time the device is connected to a power source, and the synced computer is turned on and connected to the same wifi network. These automatic backups are great, but if you want to be absolutely certain you have the most recent backup stored in iCloud before you do something like an iOS restore, software update, or even a jailbreak, you’ll probably want to do a manual backup first. Manual backups are also highly recommended to use on a regular basis if you don’t use the automatic backup feature, because otherwise you won’t have a backup of your device stored anywhere. * Note: iCloud Backups must be turned on, if they aren’t yet you will have the option to turn them on at this same settings screen. 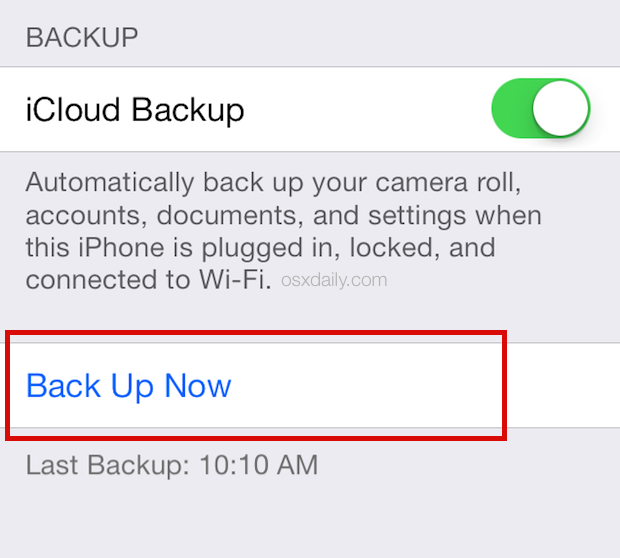 Just toggle the switch to the ON position to enable iCloud backup for your iOS device. iOS will give you an estimated time before the backup is complete, and there’s a progress bar to watch too. It’s generally fairly quick but since it’s uploading to iCloud the overall time to completion is largely dependent on your internet connection speed. Remember that you can also backup from iTunes to a desktop computer as well, which is a perfectly reasonable solution for those without broadband access or if iCloud storage is over capacity, just keep in mind that won’t save to iCloud. You are talking about 2 different back ups which only confuses people. 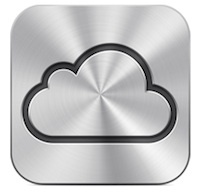 Backing up to iTunes via WiFi is not the same thing as backing up to iCloud. I recommend keeping a back up on the computer but if you are going to use iCloud to sync and back up, don’t also use iTunes to sync to also, that will only duplicate information. If you are syncing to iCloud only use that, make a manual back up on the computer by right clicking on the iOS device name under “devices” and selecting back up. This will save plenty of hassles. I use iCloud instead of iTunes now…just easier. The backup manually feature is useful. You guys should add the Google +1 feature to your site! I found this article really useful because I couldn’t find out how to backup on demand…. I wanted to support it by +1ing it but I can’t! Come on, let me thank you!!! I don’t have the “Back Up Now” option on my iPad2. How can I get it? Every time I try and backup it doesn’t complete. Therefore I have never backed up. i forgot my iphone 4s pass code and then i put it in lost mode and now i was trying to connect itunes but after i connect its showing me massage that it cant be restored because its in lost mode, so i when i am going to icloud.com there i used to click on find my phone and tried a lot to disable lost ipone option but i am not able to do it can you help me on the same i will be thankful to you.